Here at Germono Advertising Company, we operate as both a remote and brick and mortar business. We are headquartered in Norfolk, Virginia but have staff all across the states. As more businesses welcome and encourage remote staff, the benefits of water cooler chats, office meetings, and cubicle gatherings are missed. From a team-building and company morale perspective, it takes more effort to build relationships within the company. Disconnects may occur if more than one person is working on a task and staff is not physically next to each other. Accountability and deadlines may be affected because tasks aren’t discussed everyday with co-workers. From a management level, not being able to see employees leaves room for concern when employees are compensated hourly and managers aren’t able to see the employee come into or leave work. On relationships: hold virtual weekly staff meetings. Develop an agenda, but make sure to leave plenty of room for rapport so the team can get to know each other, learn from one another and discuss ideas. On disconnects: Invest in an strong communications platform for interoffice instant messages, meetings, and file sharing. We use Zoom for chatting and oscillate between Asana, Dropbox and Basecamp for file sharing. Here’s the pickle on deadlines and accountability: every staff member’s needs are different. So it’s important to understand and find the right rhythm for each person. Be clear in your deadline, send reminders and hold staff accountable. Be forgiving if there’s miscommunication, it will happen especially when dealing with time zones, programs and the general onboarding process. On work hours: Zoom and Skype show when someone is online. That helps in knowing they are in work-mode. As tasks are completed, notifications are automatically sent, resulting in an influx of activity from the various programs listed above. (Personal note: I hold myself accountable too- when they are working, I am working). Don’t forget to celebrate the team! You aren’t passing them in the hallways, so be sure to compliment and applaud them. Germono Advertising Company does not operate by itself. We have a lot of momentum and it takes strength from the entire team to keep the plane in the air. Communicate! In our weekly meetings, we take the time to go round-robin style and I ask each person if they need help or what they need from me. I have a solid team, but I want them to know I am here if they feel stuck. I give each person the room they need to complete tasks, but am available via phone call, text, video conference, or interoffice instant message. Set up the virtual time and date and send a calendar placeholder to the team. Purchase a bottle of sparkling cider for each team member (non-alcoholic, this is a baby shower for goodness sake…and we’re running a business too, so want to keep it HR-friendly). Purchase champagne flutes. You can get these at T.J. Maxx…and pick up other things you don’t really need while you’re there, but it’s T.J. Maxx, so it’s all good… you deserve that new plush throw and you needed new bedroom slippers. 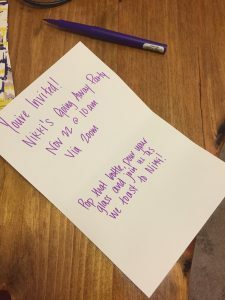 Hand write invitations, so it’s personal. This is such a nice touch, especially since most of our communication is via email or electronic. Set up an electronic greeting card for all to sign and set it to send at the time of the party. We used Groupcard and even sent it to a few of Nikki’s clients for them to sign as well. The surprise element is nice, we told Nikki we were having a special something and told her not to open any packages that arrived. The team was in on it from the beginning, so we could all build up excitement! Let’s say you have some folks who can’t make it. No biggie! Invite them to send a recording and play it for the guest during the party. Want to see how this turned out? Watch the video!